Not only do I love getting the new garden catalogs for the year, I love to learn about the new varieties that are available. Even though I have my favorites that I will forever plant year after year at My Urban Farmscape, I can’t wait for the season to begin so I can try something new. I have already started my seed sowing calendar and have realized that it’s almost time to start the majority of my veggie, herb and flower seeds. It’s this time of year when my family learns to deal with my obsession and continuous conversations with them (and sometimes, well mostly, with myself) about what gardening or plant related thoughts are in my head. My excitement continued with another 2013 AAS winner that was bred by Johnny’s Selected Seeds. A bright red cherry tomato ‘Jasper’, an F1 hybrid which is also certified organic. Nice! 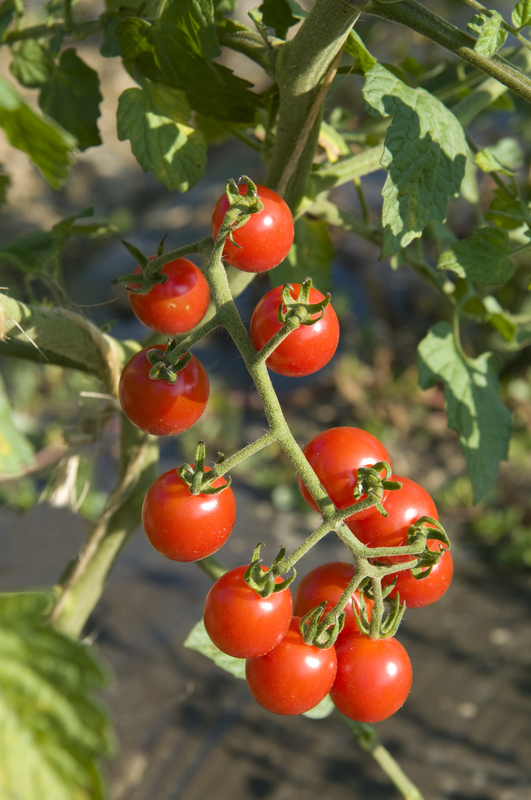 An intermediate growing cherry tomato needing to be staked which should produce fruit 90 days from sowing seeds. Johnny’s and AAS described the flavor having a “sweet, rich taste”. I think that I need to try this one. I’m sure I can fit it in somewhere. Now thinking about tomatoes reminded me about the grafted tomato plants available from Burpee. I called out to my husband, “Can you believe they are grafting tomatoes like they graft fruit trees? !” No response. I have found this to be very interesting, reading about it for the past few years and decided this is the year to buy a few plants. Simply put, an heirloom variety is the plant on the top, so you get the delicious heirloom flavor, but the roots are from a hybrid that will provide increased disease resistance. Wow! The original pink Brandywine will be my first choice. You can purchase these directly from Burpee.com or possibly your local garden retailer. I came across a new heirloom pickling cucumber ‘Miniature White’ from Baker Creek Heirloom Seeds. Not only is the flesh a creamy white, but the skin is also a creamy white. That should look nice against the green foliage. I thought that this may make an interesting addition to the garden as they say it is a high producer and grows good in a container. I was even more excited when I read about it seldom growing more than 3 feet! A true bonus for any Urban Farmscape. I became distracted wondering what color container I should plant it in and decided to go outside and rummage around the garage. I could always paint it if I didn’t have the right color. Orange? Maybe purple. That would really stand out. Not too many purple things in the garden. I don’t know. I decided to go in and ask my husband what color he thought would look good. I don’t know if he’ll respond, but I know that at least he’ll smile. Have you ever eaten sprouts? Maybe you had some tiny seedlings added to your sandwich or topped on a salad at a restaurant and wondered to yourself, what is this? You can purchase them in the fresh produce section at most grocery stores. 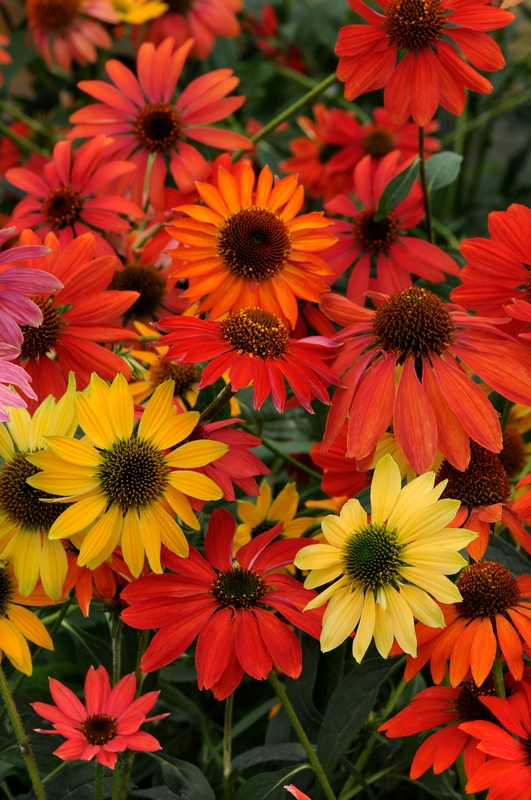 They may seem inexpensive at the time, but compared to growing them yourself you may think again. A tablespoon of seeds will produce 1 1/2 cups or more of sprouts. Alfalfa is the most commonly used and grown seed for sprouts for their fresh mild taste, but did you know that you can sprout many types of seeds which can provide spicy additions such as mustards or an additional crunch that would come from mung beans? This indoor growing project is easy enough for children and gives the whole family an affordable, quick, fresh, and nutritionally beneficial addition to meals during the winter months. Each seed has its own requirements, but they follow these few simple steps and you will have sprouts in 3-5 days at temperatures averaging around 70 degrees Fahrenheit. Experiment with different types of seeds. Make sure you are using seeds specifically for sprouting from a reputable seed supplier. They should be certified organic and tested negative for E-coli and salmonella. I use a quart Mason jar. You can also use special containers for sprouting. See links at the end of this post. Here I measured 1 tablespoon of alfalfa seeds into a quart Mason jar, covered it with a screened lid (you can use cheese cloth) and filled it half full with lukewarm water. Allow to sit overnight. The next day drain off the water. Fill the jar back up. Drain again and then swish the seeds around the jar. Lay tilted with the lid in a bowl to catch any draining water. Cover with a towel and keep in the dark. Do this about 2-3 times per day for the next few days until the sprouts have grown and you can see the little cotyledon leaves. 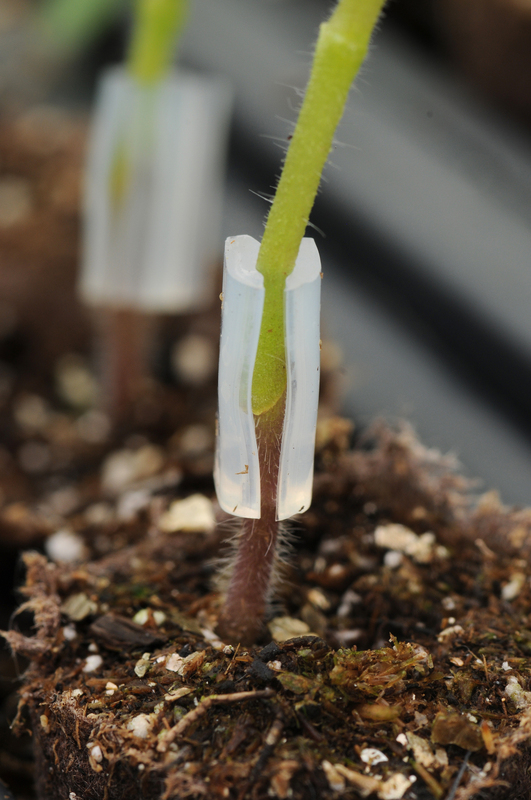 At that time you can expose them to light which will allow the leaves to green up a bit. After a final rinse, I allow them to dry a bit on a paper towel and then place in a loosely sealed storage baggy or container and keep in the veggie part of my fridge. They stay good for a week or more. Use on sandwiches, salads, wraps, or anything you desire to add freshness to this winter! Click on the links for sprouts, books and supplies. 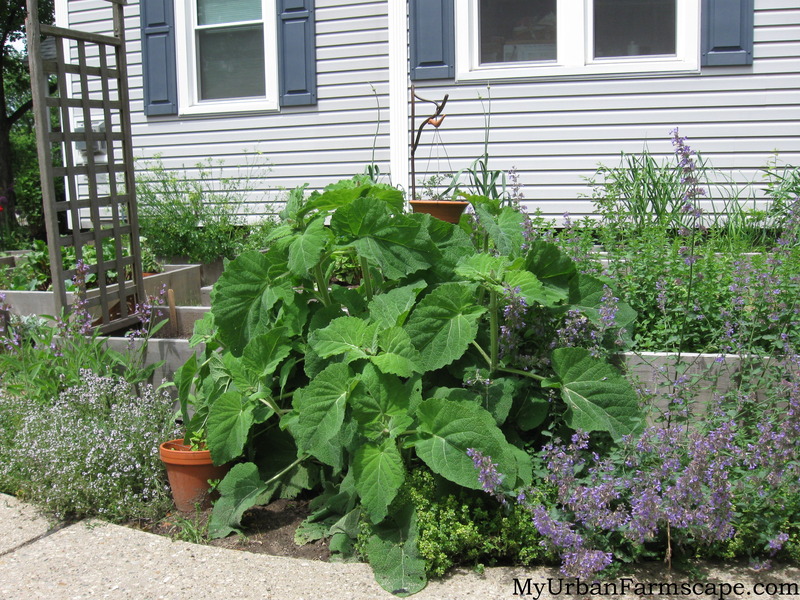 Remember to click your browser button to return back to My Urban Farmscape! In the beginning….there was an inspirational video. Today it is snowing…snowing a lot, snowing so much that instead of gardening I will read about gardening…..fiction, non-fiction, poetry, holding a book, tablet, reading online, a paper magazine or catalog, it doesn’t matter. Last year when it was snowing, I watched this video posted by Roger Doiron, Founder and Director of Kitchen Gardeners International (KGI). It inspired me so much that a couple weeks later, My Urban Farmscape was born, and I joined this revolution that Roger speaks of. Have I done what I intended to do since my first post on January 1, 2012? Maybe not as much as I would have liked to, but it’s a good start. Thank you Roger for the inspiration. To start the video…you know what to do. When you’re done, share it with your friends. Seriously, haven’t you heard enough about cyber Monday and all the deals that could be out there? Well, I have…except for the deals I find for my gardening friends! The holiday season is upon us and honestly, I won’t tolerate another gift that is marketed to gardeners that really has no useful purpose. Like a Chia Pet for example. I love plants, and love growing them, but have no desire to have a terra cotta bust of Homer Simpson with chia hair! So, with that, here are some of my favorites with the links to these awesome gardening products on Amazon as well as suggested gifts for gardeners. When you click on a picture it will take you straight to the product. Don’t forget to come back to My Urban Farmscape! My Favorite Urban Farmscaper Gifts! 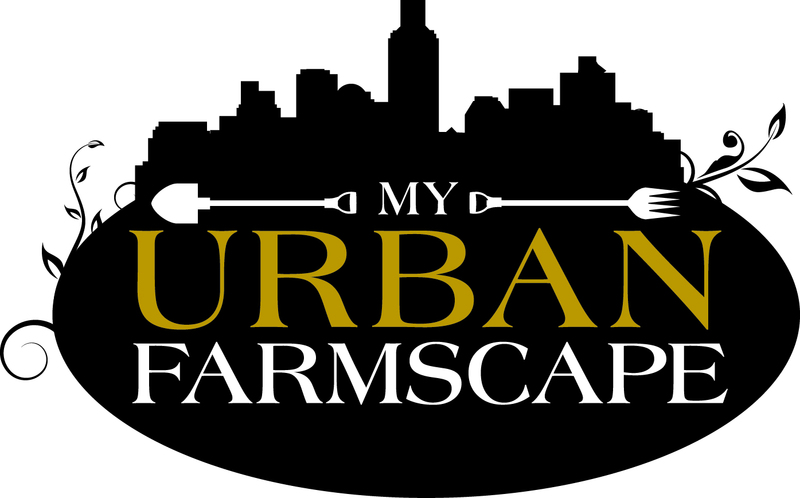 The Ultimate Urban Farmscaper’s Gift! Why not have it all in this compact space. A raised bed with an optional greenhouse to extend your gardening season. A great idea for a senior or Farmscaper who has everything…except this! I love this Jewel Coldframe that I mentioned in an earlier post and use at My Urban Farmscape to extend the season. When you aren’t using it in the garden, it can be broken down for easy storage. This Earth Box below is great for those of you with little space and with little time tending to garden chores. Maybe you didn’t find the time, or forgot to water last year? A perfect gift for the busy Urban Farmscaper. Some of my favorite pruners to use in the garden for harvesting as well as in the kitchen for cutting fresh herbs. For indoor growing and seed starting, supplemental lights are a must have. For quality and compact sizes, here are two of my favorites. For the garden photographer the right kind of lens or camera can really help to capture the tiny life living in the garden. Books for Urban Farmscapers that love to grow food in small spaces, and even for those growing in not so small spaces. Books for preserving and cooking food you grow or buy at the farmers markets. Great gifts for someone that is trying to eat local and seasonally. Magazine subscriptions that are full of useful information about gardening, cooking and homesteading. I keep every issue of mine for reference. Garden fun and games for farmscapers of all ages and for the future farmscapers. Indoor Urban Farmscaping for someone who may have limited indoor growing space. Make sure you click the pic to go to Amazon! 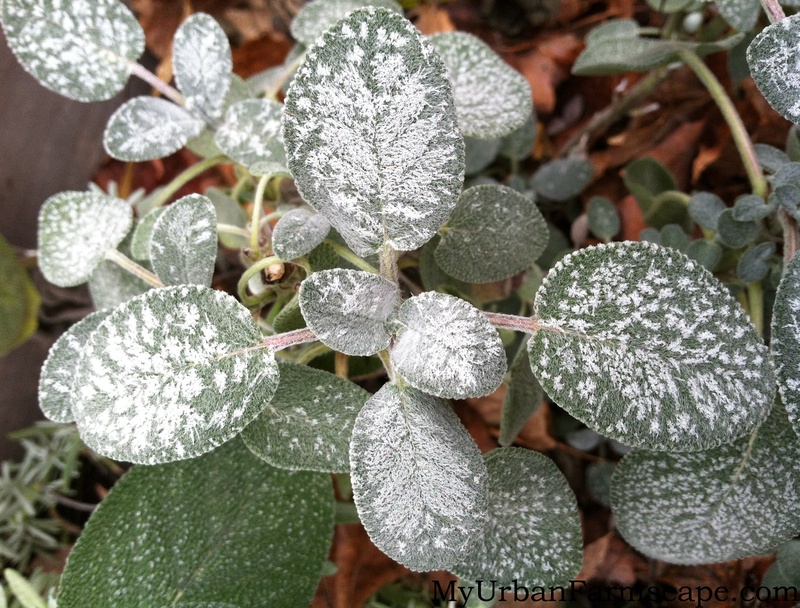 After a hard frost last week I noticed how beautiful the icy crystals looked on my sage plant. As I continued to take pictures, I reminisced about its earthy flavor and how Thanksgiving wouldn’t be complete if this herb wasn’t included in the stuffing. I also use fresh sage leaves and incorporate into any Mediterranean dish. I am surprised at how it tastes so different from the dry powder my mom would use when I was younger and now, how it adds the right balance when prepared properly. I also love to make a rub of sage, salt and pepper. I use this on a pork roast. Not only is sage, Salvia officinalis, used for culinary purposes, it also has some medicinal properties. Although I am not a practicing herbalist, or have I ever prepared an infusion of sage leaves in water to make a tea, or created any sage tinctures, I have read that sage is known for its effect in the reduction of perspiration. I have also read that extended or excessive use of sage can cause symptoms of poisoning! I found this information in a book by John Lust titled, The Herb Book. White sage, Salvia apiana, is a ceremonial herb used by Native Americans. This is the preferred herb for making smudge sticks. The leaves are smooth and the color is a lighter shade of grey. 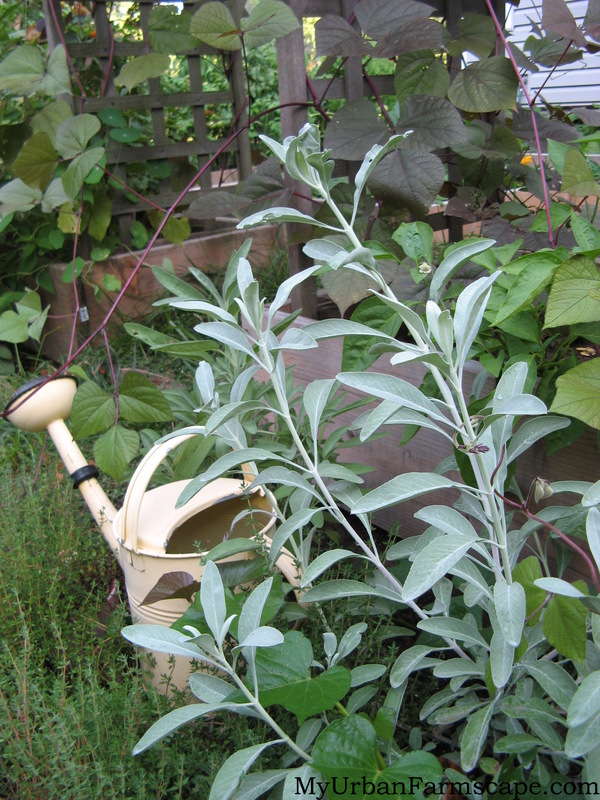 I love growing sage, and it is the perfect herb for an urban farmscape. Why? Because culinary sages can be harvested throughout the season, can be dried and kept for long periods of time, and you can make useful gifts from your garden. They also look beautiful as there is nothing else that I can think of that has that grey color or texture. A member of the mint family, sage is easier to manage and shouldn’t spread like some of its cousins. For culinary use, I grow Salvia officinalis ‘Berggarten’ for its large rounded leaves, as well as Salvia officinalis ‘Extrakta’ which is higher in oils and a plant that I collect seeds from each year. There is, however, a sage that I grew this summer that does not work well in an urban farmscape. 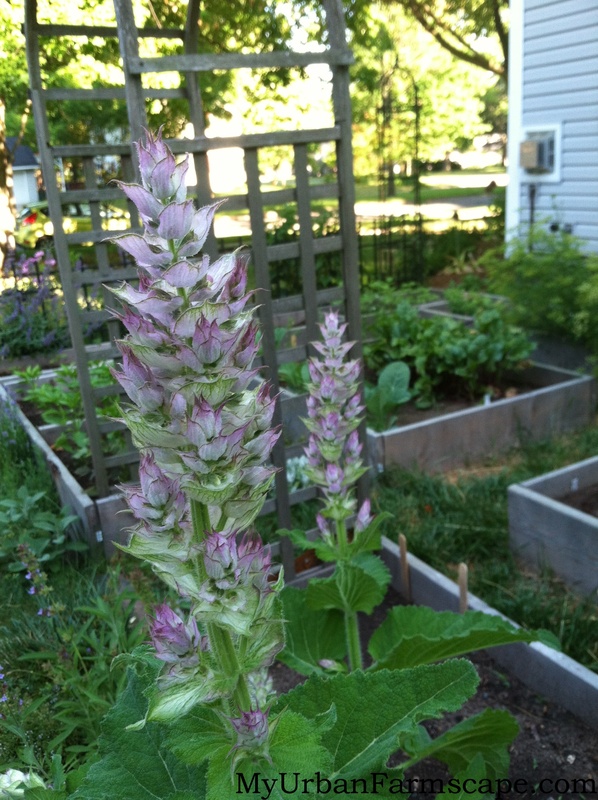 That would be Clary Sage, Salvia sclarea. A biennial plant that will flower in its second year, growing small the first year, and exploding the following year both in size, flowers and seeds! Clary has beautiful leaves, big like rhubarb but light green, bumpy and fuzzy. I loved it earlier in the season. The flower heads hung down as they started to form, and as the flowers opened, they stood straight up as if they were shouting to the bees, “Here I am!” And boy oh boy, did the bees come! 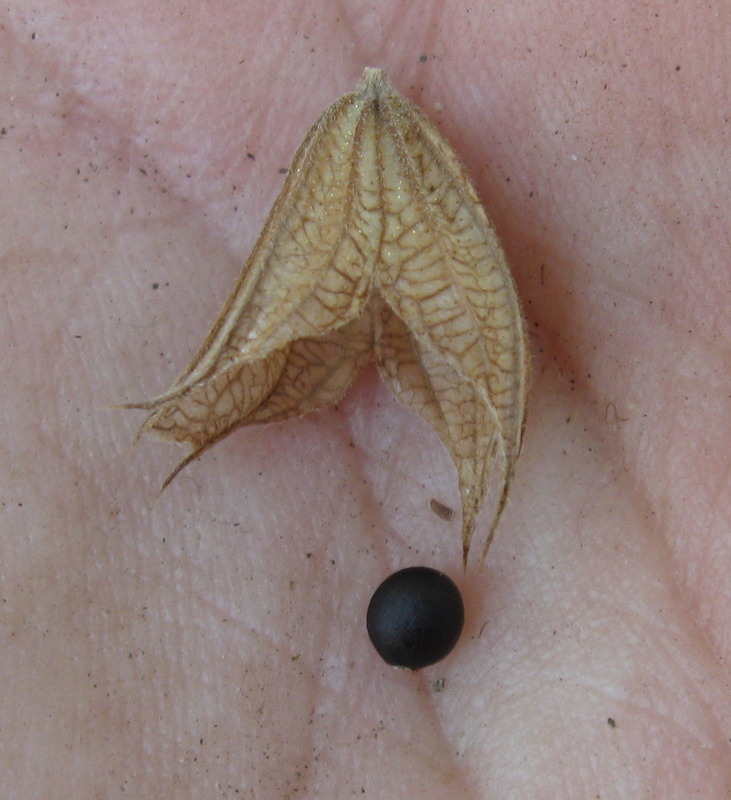 It flowered for the whole month of August, and I was able to collect many seeds. So, here was the problem. I planted it next to the driveway, where every time my husband came home he would have to brush against it. He really didn’t like the smell of it. And if you touched it, the oils stayed on you and your clothes, thus allowing its fragrance to linger. I love the smell of sage, but many people don’t. I grew this sage to add to my collection. I need to find a different place in the garden where it will get a lot of sun. That will be tough. 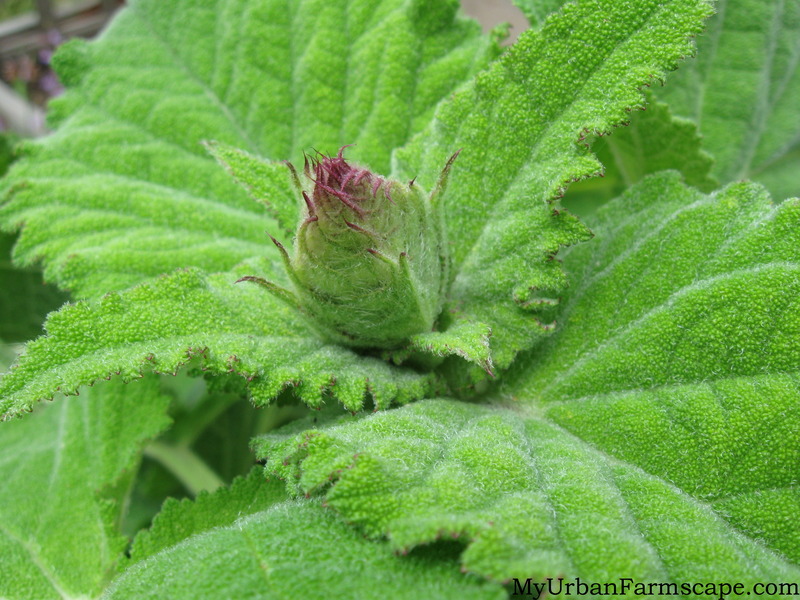 Clary sage is a medicinal herb, used mostly for its oils. I have no way of distilling oils from plants; I just really like the way it looks and the bees that it attracted to my garden. So, here is my “sage advice”. Keep the culinary varieties in your urban farmscape, add some spice to your life and your food, maybe grow a little ceremonial sage to burn and cleanse the air, and save the Clary Sage for a sunny spot for a beautiful, eye-catching, dynamic bee plant….a little distance, but not too far from your walking path. Just because it’s November in Michigan, don’t think for a minute that there isn’t much gardening to write about at My Urban Farmscape. Look at the above picture for example. 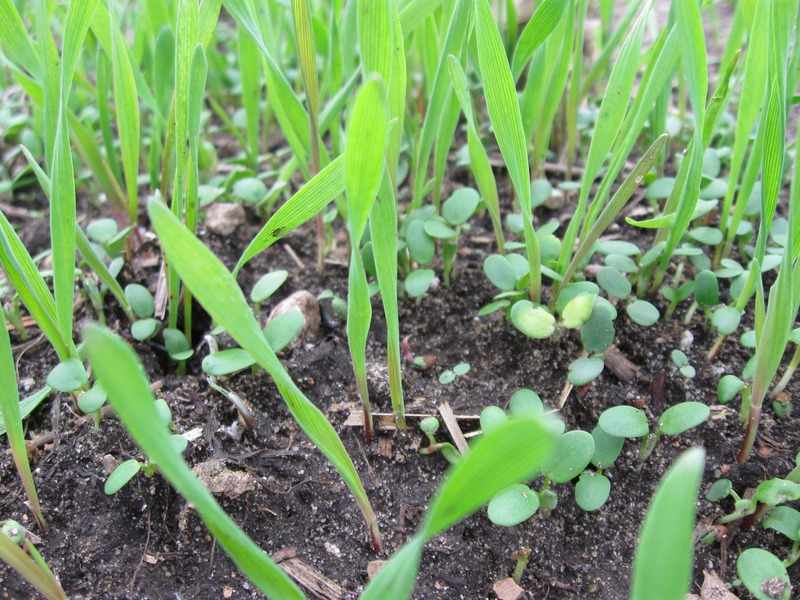 This is a cover crop of clover and rye that I planted which will be tilled into the soil in early spring . If you garden on a slope, a cover crop will help prevent soil erosion. You could add a cover crop during the growing season to help to suppress weeds, or provide additional fertility to the soil which is what I am doing, only I chose mine specifically for planting in the fall. These green manures help organic farmers improve soil fertility from year to year in order to keep their organic certification. Or, even if not certified organic, farmers have learned the value cover crops. Many people forget about the commitment to the earth and the environment our farmers have. I think that using a cover crop is one of the most important things you, as an urban farmer, can do to improve the soil. Feed the soil, which in return, feeds the plant. I talked about this in the post I wrote earlier in the season titled “Talkin Dirty”, here’s the link http://wp.me/p1GoP9-60 I did mention in that post about adding greensand and rock phosphate at this time too. So, cover crop planted, soil amendments added, gardening season over? Never.